In 2018 I started receiving emails from Ezoic representatives saying they could increase the ad revenue on two of my sites. Sceptical of their claims and too busy with other jobs at the time, I ignored their emails and eventually forgot about it. A year later they emailed me again with another invitation to join their platform. It was around the same time I was browsing a competitor’s site and noticed they had Ezoic logos under their ad slots, so I decided to do some more research on the company and their claims. The first email I received from Ezoic said they could boost my ad revenue by 60%. I am reaching out to you about Ezoic (Google Certified Publisher) where we use machine learning technology to provide ideal ad layouts on a per-user basis. This allows our publishers to see around a 60% lift in their overall revenue while their user experience metrics improve dramatically. So, they will use robots to magically increase my ad revenue by 60%? It initially sounded very far fetched and too good to be true, and why I initially ignored their emails. But Ezoic were persistent and emailed a few more times. Ezoic is also free and we don’t require a contract so there are absolutely no tie-ins! If you’re interested in joining over 1,000 other publishers currently working with us, just give me a short reply. Thanks! An increase of ad revenue anywhere between 60% and 200%. No contract. You can easily disable Ezoic whenever you want. Helpful support team of Google Certified Publishers with the expertise to maximize your ad revenue. I contacted an Ezoic representative to see if the invitation was still open and within a day I had my account set up and integrated with one of my WordPress sites. So, has Ezoic managed to increase my ad revenue or not? Prior to joining Ezoic, I was earning anywhere between $5 and $10 a day on one site. When I switched to Ezoic on the 20th Feb, I was seeing figures between $10 and $30 consistently. 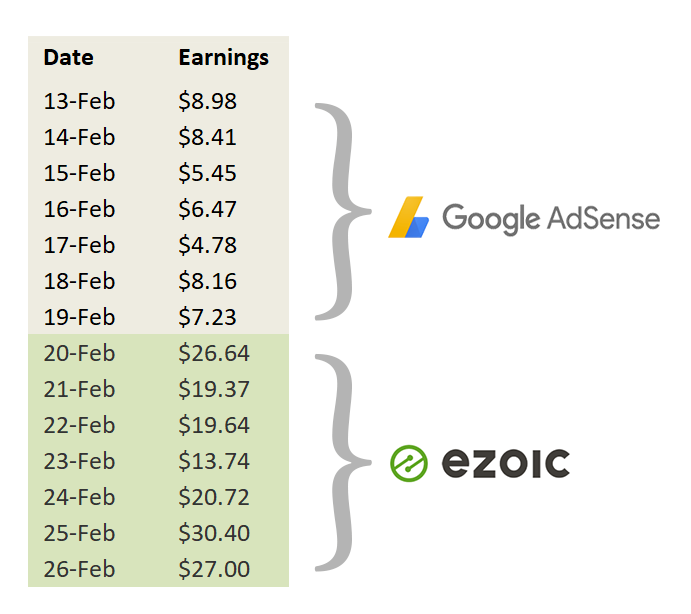 Here are the numbers comparing one month of earnings with AdSense and one month with Ezoic. A 68% increase in ad revenue. Robots! Machine learning algorithms testing different ad locations, sizes and combinations to see which ads people click the most. And it improves over time as it learns about your users. Ezoic tailors ads per user, so the longer you have it running on your site, the better it gets. I will be updating this Ezoic review in the coming months to report my findings. Head over to Ezoic’s website to read about how the technology works, they explain it far better than I can! The numbers are undeniable. Revenue is up 68% this month and I plan to continue with the platform for now. In several other Ezoic reviews I’ve read, users report that their revenue continued to rise after several months. As Ezoic’s machine learning algorithms gather more data about your visitors, their performance improves. I will update this Ezoic review again in a few months to report changes in revenue. 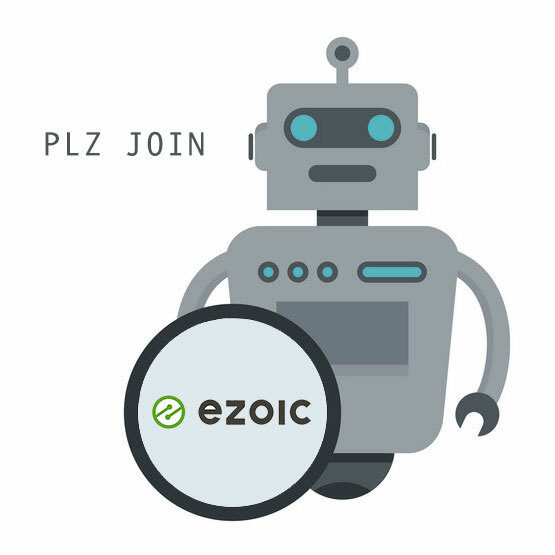 Ezoic’s support team is also very helpful and fast to respond. They were able to walk me through the entire integration process and advise me on ad placement and site layout to maximize revenue. If you have already been contacted by Ezoic and invited to join, you probably already pass all the requirements and can sign up right away. You must have an AdSense account and ads already served on your site. You must have at least 10,000 monthly visits, and they will want to see your Analytics account for proof. Prior to joining Ezoic and integrating my site, I read a lot of other Ezoic reviews looking for answers to the following questions and concerns I had myself. If you have any questions not answered below, feel free to ask me in the comments. Is there a contract or any hidden terms? No. This was one of my main concerns and I made sure read the Ezoic Terms and Conditions thoroughly before signing up. You can always turn Ezoic off temporarily or permanently if you are not happy with the results. You simply wrap your current AdSense ads in a <div> placeholder and then add a piece of script to your <head>. If you are using WordPress, there is a special Ezoic integration plugin. There is also a Cloudflare integration method, which is a little more involved. A support representative will help you through the entire integration process. Ezoic pay you via international bank transfer, check or PayPal on the 4th of each month. They also recommend that you display a small percentage of ads from AdSense so they can run direct comparisons, and you may still receive monthly payments from AdSense as well. After your first 30 days trial, Ezoic places a small ad on the bottom of your page, which allows them to earn a small amount of ad revenue from you. You can remove this ad by signing up for a Premium account starting at $49 p/m, which gives you access to premium CPM advertisers, and from what I’ve read, the cost more than pays for itself. Do I have to point my nameservers to Ezoic? No. There are two main integration methods; one involves placing a script in your <head> and the other involves pointing your nameservers to Ezoic. If you don’t feel comfortable changing your namesservers, you can just place the script in your <head> instead. Why do they need access to my AdSense account? You need to link your AdSense account with Ezoic, but you can revoke this permission at any time if you’re not happy with the results. Once linked, Ezoic will automatically pull in the data from AdSense on the traffic going to the non-Ezoic version of your pages, so they can run a direct comparison. It allows them to establish a baseline for improving ad revenue, which in turn speeds up the optimization process. Why do they need access to my Google Analytics account? Your site must have least 10,000 monthly visits to join the platform, and Ezoic will need to see proof of that in your Analytics account. You can always revoke the permissions later. Hopefully this Ezoic review will allay any concerns you had about joining the platform. 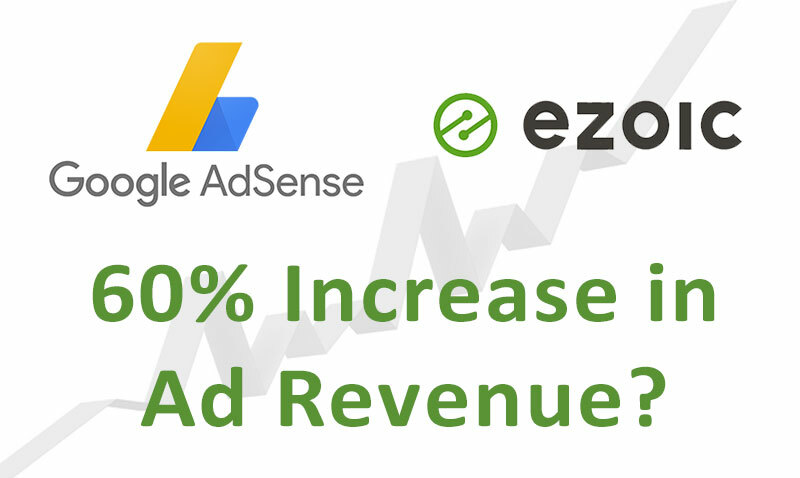 I was initially very sceptical about Ezoic’s claims and was wary about doing any sort integration with them, but the results are promising and a 68% increase in revenue is game-changing for me. I have two more sites that I want to integrate so another Ezoic review shall be forthcoming. For more in-depth information about Ezoic’s platform and how it all works, head over to their website. Just a question. If Ezoic is this good, why are you not using it currently on this blog? It is running on this site. Do you not see the Ezoic logo under some of the ads?